We made Arduino style library to easy the stand alone ESP8266 programming, but we were not using any IDE but mostly command line compile and programming. Two of our developers decided to use Eclipse and set it up for ESP8266 tools. Yesterday we spotted on ESP8266_wiki GitHub account that someone already add support for ESP8266 in the latest Arduino 1.6.1 IDE release, how cool is this? I decide to try it today. I downloaded the pre-build binaries arduino-1.6.1-linux64.tar.xz and decompress it in /home folder then ran terminal and “sudo ./arduino” in the Arduino-1.6.1 folder, the Arduino IDE was launched. From examples loaded Blink LED then changed the port 13 to port 5 where the relay is connected. I pressed the ESP8266-EVB button and connect 5V power supply to board to make it enter in bootloader mode, then click on Upload button. The sketch was compiled and uploaded successfully then the relay start to switch on and off like expected. Well done! I didn’t check all the libraries, but I see inside demos for web servers etc. Nice work! It’s an Arduino clone with onboard Wifi that is smaller & cheaper & faster than a plain Arduino! 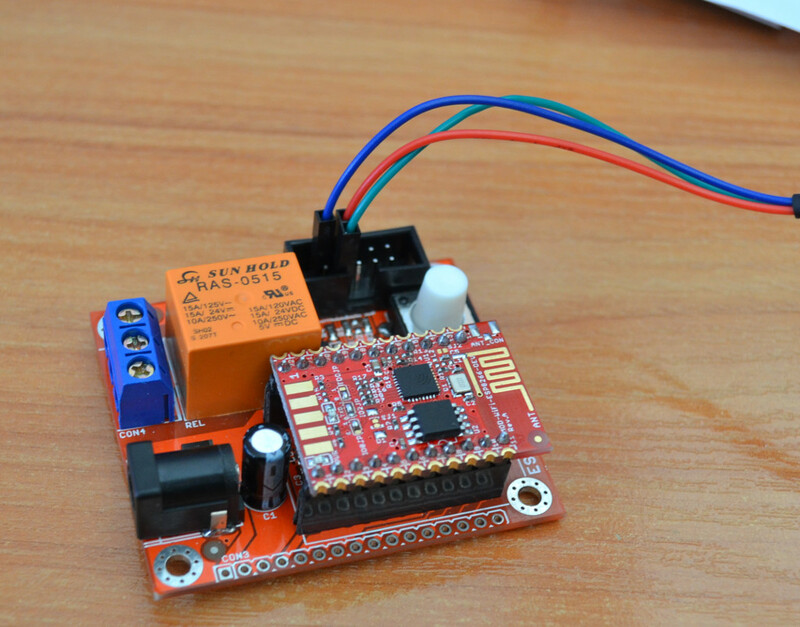 Hello, I am trying to program ESP8266-evb to be able to get data from android application. After entering the bootloader mode, I tested AT commands on serial monitor but nothing appeared.. Can anybody help me? Please, tell me when do you unpress button? Disconnect power, press button on board, connect power, release button. 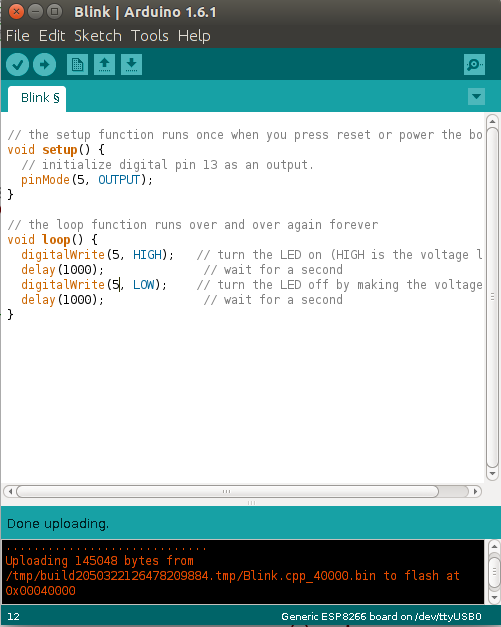 Then press ‘upload’ in Arduino IDE. Make sure you don’t have connected Vcc of your UsbToSerial device to Olimex-Vcc (but GNDs must be connected). Otherwise 2 power suplies could start an open-ended competition.